Chicago Craft Beer Week is upon us, folks! If you are in the Chicagoland area, get ready to enjoy a bunch of beer-focused events running from tomorrow through May 25. These range in size from huge beer fests to neighborhood bar tap takeovers and feature breweries of all sizes and locations with a great local focus. While you can check the official website for a listing of most events, we’ve also compiled a guide of our favorite events during the week. 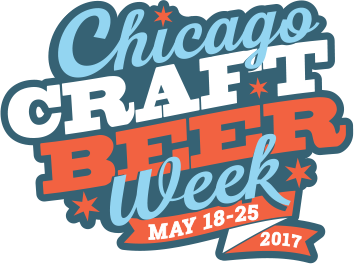 Click here to check our our Chicago Craft Beer Week 2017 Guide! Regardless, we hope you have a blast drinking delicious local beer this week! We’ve included more beer related information below. Pair singing with suds in beer choir in Chicago’s northwest suburbs. Link. Alarmist Brewing’s new taproom features some great summer beers. Link. Revolution Brewing is an official White Sox sponsor. Link. Learn more about the 1855 Lager Beer Riots. Link. Lagunitas has sold completely to Heineken. Read why from Lagunitas’s Tony Magee. Link. South Side Brewer Open Outcry Brewing hopes to be open by Memorial Day. Link. Baderbrau has added a kitchen to its taproom. Link. Here are 6 U.S. Cities for your next beer vacation. Link. Anheuser-Busch’s deal to purchase Wicked Weed did not go over well in the craft beer community. Link. To survive, craft brewers turn to cocktails, coffee, and bicycles. Link. Creature Comfort’s CEO is highly suspicious of Anheuser-Busch, including their recent craft brewery acquisitions. Link. Beer tourism is on the rise. Link. There is a fruit invasion in craft beer. Link. A runner consumed 13 beers – 1 for each mile – and still finished his half marathon. Link. The world’s first 1,000 pack of beer is available in Finland. Link. Beer is now being brewed with urine…sort of. Link. Beer is a better painkiller than acetaminophen. Link. Goose Island is expanding globally. Link. Thank you for reading and your support! ??????????? ?